The People’s Republic of Angola is located on the west coast of southern Africa, bordered in the north and north-east by the Democratic Republic of Congo, on the east side by Zambia, on the south by Namibia, and on the west by the Atlantic Ocean. It also includes the enclave of Cabinda, which is physically separate from Angola proper and is surrounded on its landward side by the People’s Republic of the Congo (Brazzaville) and the Democratic Republic of the Congo. Angola is a member of the Paris Convention and of WTO/TRIPS. Provision is made (chapter IV) for the registration of trade marks for goods and for services, and for collective marks. The Act refers to industrial, trade and service marks without, however, defining these classes of marks. Express provision is made for the registration in a single registration of a series of marks from the same enterprise or establishment, whether the same or different from one another, and irrespective of the indication of products. No express provision is made for defensive marks. The Act also provides for the registration of awards (chapter V), of establishment names and emblems (chapter VI), and of indications of origin (chapter VII). The Act expressly refers to foreign marks, by stating that foreign marks will be registrable provided the mark relates to trade, industrial or professional activity legitimately carried out in the country of origin. Angola is a member of the Paris Convention. Design protection or protection for a utility model may be obtained by way of a national filing. 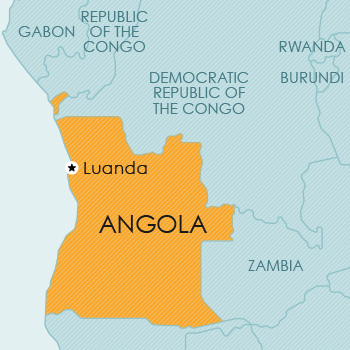 Since Angola is a member of the Paris Convention, priority may be claimed. Although it is not entirely clear, from the wording of the law, whether all provisions stipulated in respect of industrial designs will also apply to utility models, it seems that a similar registration process and outcomes are contemplated. The effect of a design registration (and probably also a utility model registration) is to confer on the owner of a design or a model, throughout Angola, the exclusive right to use the design or model by way of the manufacture, sale or exploitation of the article to which the design or model is to be applied. Angola is not a member of the Berne Convention. compilations of works, anthologies, encyclopaedias. Currently, no legislative provision for plant breeders’ rights or other sui generis protection for plants is available in Angola. Sociedades por quotas (SpQs), which are similar to private limited companies. SpQs are companies in which the share capital is divided into quotas and the shareholders are jointly and severally liable for their capital investment. SpQs must have at least 2 shareholders. Sociedades anónimas de responsabilidade limitada (SARLs), which resemble joint stock companies. SARLs are companies in which the capital is held by its shareholders and divided into shares, with each shareholder owning a number of shares proportionate to their investment. The liability of each shareholder is limited to the amount of their capital share. SARLs must have at least 5 shareholders. Approval of the new company name by the Companies Registry. Execution of a public deed of incorporation before a public notary (Provided that the company’s initial share capital has been deposited in a national bank account). Publication of the new company’s by-laws in the Official National Gazette. Registration of the new company before the Ministry of Public Administration, Employment, and Social Security. Registration of the new company before the tax authorities (And payment of the applicable taxes). This process takes roughly 3 working days. Following the incorporation of the company, the proper commercial operations certificate (Alvará Comercial) must be obtained from the Ministry of Commerce. In some cases, it may be required to obtain an additional certificate from the Ministry responsible for the activity carried out by the company. The approval time for this second certificate depends on the specific requirements involved, such as whether or not any additional facilities’ inspections are required. Both SpQs and SARLs must have Annual General Meetings that must take place within the first 3 months of each calendar year and, once the annual accounts have been approved, they must be submitted to the commercial registry. For SpQs, the minimum share capital is USD 20 000. At least 30% of the share capital must be paid at the moment of incorporation. Each share must be equivalent to USD 5. For SARLs, the minimum share capital is USD 1 000. A minimum of USD 1 000 of the share capital must be paid at the moment of incorporation and must constitute at least 50% of the share capital. It is sufficient for 2 shareholders to incorporate such companies. Each share must be equivalent to USD 10. SpQs must be managed by at least 1 director (Gerentes). There is no maximum number of directors, whereas SARLs are generally managed by a board of directors (Conselho de administração) with a minimum of 3 directors. There must be an odd number of directors but there is no maximum number. SARLs may have a sole director (administrador único), provided the company’s share capital does not exceed USD 50 000 and the company’s by-laws provide for this. There are no nationality restrictions from a director’s point of view. Whilst 100% foreign ownership is permitted, this will greatly extend the time it will take to incorporate the company. There are also certain sectors including the oil and gas sector, mining sector and certain parts of the transport sector that require a certain percentage of local ownership. It is possible to establish a branch in Angola. A branch’s holding company will, however, retain full liability and the branch is treated purely as an extension of the parent company. As an alternative, Angola allows for a foreign company to establish a representative office which can be a natural person or a company in order to promote the foreign company’s business in Angola. Representative offices are commercially limited as business vehicles. There are limitations in respect of a representative office’s capacity to enter in to contracts and the number of people who may be employed. Angola currently has no national competition law or policy in place. However, in certain instances specific sector or industry legislation makes provision for competition related aspects. Further to the paragraph above, competition law is not regulated in Angola and there are, accordingly, no specific merger controls in place. Although competition in general is not regulated in Angola, certain types of cartel conduct may fall foul of industry or sector specific legislation. Single firm conduct is not regulated in Angola. There is, accordingly, no abuse of dominance provisions to contend with. As Angola has no competition legislation and/or policy in place, there are no specific sanctions in regard to competition law. Consumer protection is regulated by Angola’s Consumer Protection Act Law no. 15/03, in conjunction with certain provisions of Angola’s Constitution. A consumer who purchaser real estate is entitled to a minimum guarantee of 5 years in respect of such property. All goods and services must comply with and meet the legitimate expectations of consumers. A supplier of mobile non-consumable goods must ensure that such good will perform the functions for which it was purchased for a period of not less than 1 year. Should a supplier become aware that its goods pose any threats to the well-being of consumers, said supplier must immediately notify the competent authorities of the nature of the threats posed by the goods. The supplier is also obligated to notify the consumers through notices in the media. Data protection is regulated by the Lei de Protecção de Dados pessoais (Personal Data Protection Law) of 2011 (PDA). The PDA regulates how the collection, transfer and use of a data subject’s personal data must be performed, so as to avoid any violation of the data subject’s rights to, among other things, privacy. The Angolan Data Protection Agency (ADP) (yet to be created) must be notified of the use and processing of a data subject’s personal data. Personal data may only be transmitted to a foreign country if such foreign country has, and provides, an unimpeachable level of data protection. Non-compliance with the PDA is an offence which, if convicted, is punishable by sanctions (i.e. civil and/or criminal liability) and fines, up to USD 150 000, or both. Although the Constitution provides for the creation of a Constitutional Court, it has yet to be officially created and thus the Supreme Court is the highest court and the temporary guardian of the Constitution. The Supreme Court (known locally as Tribunal Supremo) has constitutional jurisdiction, appellate jurisdiction over lower courts as well as original jurisdiction. The lower courts are made up of both provincial courts and municipal courts and specialist courts exist in respect of the military and financial regulations. The Angolan Bar Association is the professional roll for legal professionals in Angola. Arbitration is a recognized form of dispute resolution and the primary authority is the Voluntary Arbitration Law (VAL), 2003 which governs both domestic and international arbitration. The VAL is not based on the UNCITRAL Model Law. Angola is not a signatory of the 1958 New York Convention on the Recognition and Enforcement of Foreign Arbitral Awards. General Employment Law, approved by Law 2/00 of 11 February 2000. Written employment agreements are only required for temporary employment agreements and employment agreements entered into with foreign employees. Permanent contracts. May include a sixty-day probation period which the parties by written agreement can either waive or reduce. It may be extended to a maximum of 4 months for highly skilled employees who perform complex work and to a maximum of 6 months for employees who perform work of a highly technical complexity or who have management functions for which a high level of academic degree is required. Fixed term contracts for a specific period to fulfil temporary needs of the employer must be in writing, foresee the specific reasons which granted it and its duration may vary between 6-36 months. Probation shall only exist if established in writing, the duration cannot exceed fifteen days for non-qualified employees or thrity days for qualified employees and either party may terminate the employment contract without prior notice, indemnification or justification. Employers can only terminate an employment agreement for reasons related to just cause, or collective dismissal, or redundancy due to abolition of work position. Must be followed by a hearing, followed by a dismissal with, or without, notice or compensation. The Labour Chamber of the Provincial Courts has jurisdiction over individual labour disputes. Preliminary mandatory conciliation for individual labour disputes is required conducted by the Provincial Conciliation Body. No mandatory conciliation when the dispute relates to nullity of the individual disciplinary dismissal where the allegation is that the employer failed to observe the procedural requirements of such dismissal or it is based on prohibited grounds; or relates to unlawful collective dismissal because the employer failed to prove the existence of the economic, technological or structural reasons or the employer did not follow proper procedure; or the absence of authorization required for an individual dismissal based on objective grounds – file a law suit with the labour section of the appropriate Court. Unfair dismissal – either reinstate or compensation. All foreign exchange transactions are subject to compliance with the exchange control regulations imposed by the Angolan National Bank (BNA). Under such regulations there are limitations on the amount of currency that can be transferred out of Angola. While there are no restrictions on the amount of foreign currency that may be brought into the country, transferring the Angolan Kwanza out of the country is restricted. All import, export and re-export of m1y may only be undertaken by financial institutions duly authorized to exercise foreign exchange by the BNA. The repatriation of dividends to a foreign country is only allowed if the amount of investment in the Angolan company exceeds USD 250 000. Capital may also be repatriated but only with prior approval from the BNA. Dividends are annually transferable after approval by the BNA. Liability for income tax in Angola is determined by the source of the income. Employment income tax is due on any income resulting from personal services rendered in Angola, by employed or self-employed individuals, who are directly or indirectly paid by an Angolan based entity and is subject to a monthly withholding tax, to be made by the employer and paid to the tax authorities on a monthly basis. Types of income that are subject to tax include employment income, business and professional income, investment income and capital gains (although some exemptions may apply on interest and capital gains). Resident companies are taxed on their worldwide income at a rate of 35%. The branch of a non-resident company is taxed only on its Angolan revenues at a rate of 35%. Employees are subject to personal income tax at a progressive rate up to a maximum rate of 17%. Independent professionals are subject to tax at a flat rate of 15% on 70% of total income received or at a flat rate of 20% if accounting records are in order. At the date of publication, Angola has not concluded any double tax agreements.